Happy Monday Stampers, I've found a new love!! 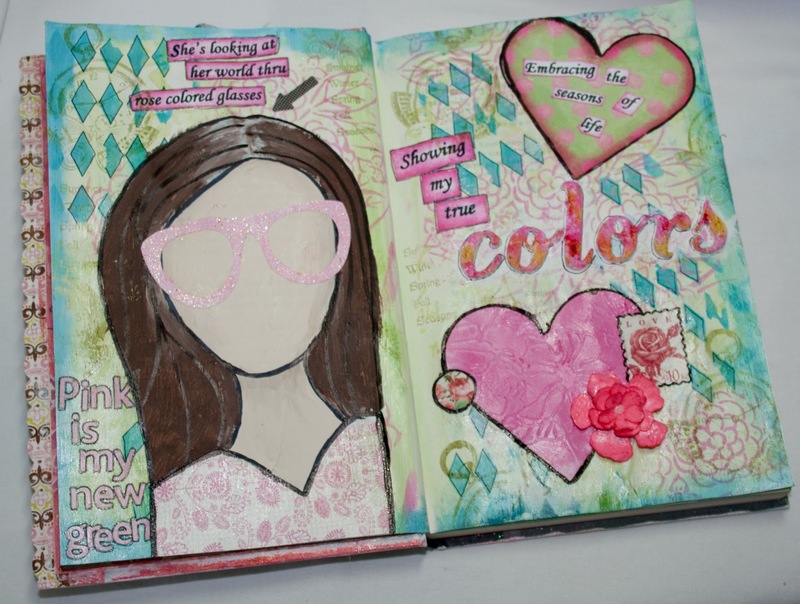 Altered Books!! I started about a month ago and have had so much fun playing with all the different possibilities. 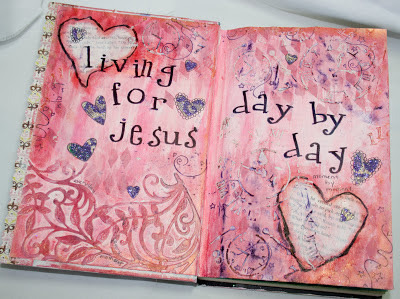 What I love the most is the texture on the pages and the unlimited way of making your pages! I tried doing this before several years back but had such a hard time wrecking a perfectly good book. I've since just picked books I don't like and it's not a problem! lol I have used so many techniques and different products on the pages it's hard to name them all but I will try. 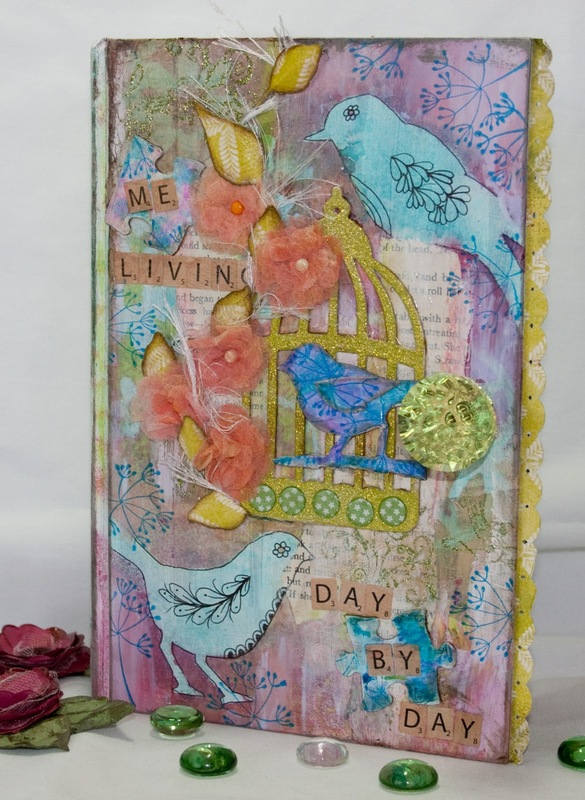 On the cover I used gesso first then sprays and stencils to start with, then doddled on the birds a bit. Embossed on chipboard cut out with Sizzix dies, made dryer sheet flowers and a vine with leaves using wire. The door knob (I will take a side picture so you can see the dimension) was bought at Michael's a year back. I gessoed puzzle pieces and inked them. Stamped with Stazon ink. Stamp and embossed on tissue paper scraps...used stickers for my title. I used Medium Gel to apply the pieces to the cover. On the first page, I used the my new Spellbinders Botanical Swirls (bottom left) and used Medium Gel to apply, then inked the pages with Memento ink. Then I used stencils. The hearts are torn out from scrap pages of the book, then gessoed and inked using Brilliance Rocket Red (so were the edges of the pages). The other hearts are left over scraps of some glitter lace background laying around. Then I used the time stencil and molding paste. The words are stamped and so are some other background. The second page was started by applying the Memento inks directly to the book page, then I added a bit of gesso to tone it down. The borders are stamped and embossed. Butterflies where laying on my desk and I used those, the top one is fabric, the right middle one is actually Mudd Puddles using a stencil I made and the bottom one is mirror cardstock and sticker paper with glitter. The words where hand written and watercolored. 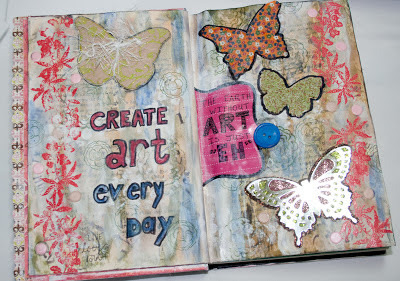 The third page is inspired from"She Art" I did my background by starting with gesso, and stencils with Memento ink. Then I cut out the girl with another scrap book page and colored with acrylic paints, the shirt is cut out from a piece of Authenqiue paper. The glasses where cut out with my Pazzles and embossed with Pretty Princess EP. I used stickers for some of the words and printed words from my computer. I also stamped on the background. I am so excited about doing more pages in my book and expanding on techniques!! Great new hobby, Jill! Love what you have done with the free form painting and colors! So creative Jill - I love how it just flows from one theme to another, using so many different techniques. Thanks for sharing. What a fabulous project Jill... I love what you've done so far! The cover is awesome and I really enjoyed looking at each page with all the different elements. I'm looking forward to seeing more! I have been so tempted to try this but keep holding off. Your wonderful project might just pull me in! !